The last of yesterday’s windy weather passed through at 1300 as sailors launched on day four of the RYA Youth National Championships at Plas Heli. After racing was cancelled for most classes on day three, all fleets had an extra race scheduled and the Race Officers motored through the day completing 34 races. Tomorrow (Friday) will see competitors’ race in front of a Royal audience as HRH The Princess Royal will be on site greeting sailors in the boat park. Andy Brown (Largs) maintains his lead in the RS:X with a 3,1,3,2 score line, three points ahead of Matthew Carey in second and James Hatcher (Bristol Corinthian), a further three points behind, in third. In the girls’ RS:X Emily Hall (WPNSA) leads the charge with a seven point lead over rival Lily Young. “It was quite a tough day,” said Hall. “You had to pick your side right and I think I did alright, consolidated on what I had to do, kept in the gusts as much as possible and on the lifting tack, sometimes I made some mistakes but I did pick it back up again. Ellie Cumpsty (CVLSC) ruled the girls’ fleet, winning all four of her Laser Radial races. “I’m just going to fight hard and get the wind shifts like I did today, and see what happens,” concluded Cumpsty. Clementine Thompson (Guernsey) has jumped up the leader board to second but six points still separate her and Cumpsty, Chloe Barr (Stokes Bay) completes the top three. The second discard for Lasers comes in at race 9 but Whaley would prefer it to stay as it is: “I wish there wasn’t discards, but it’s still pretty close. Sam’s pretty close behind. I’m confident but not overly happy. Yesterday’s leader Sam Whaley dropped down to second posting a disappointing 15th in last race today, Harry Blowers’ first and third put him in third overall. In the 29er class Crispin Beaumont and Tom Darling (HISC) extended their lead with a 1,3,1,1 score line, they are confident as the final day approaches said Darling: “It’s really nice to have some consistent results, we haven’t used our discard yet so that’s in the bank. So really happy, looking forward to tomorrow, see what is has in store. Beaumont and Darling have a big lead over Nick Robbins and Jake Todd in second and Arran Holman and Nathaniel Gordon in third. Phoebe Connellan and Sophie Otter (Grafham Water) maintain their girls lead. 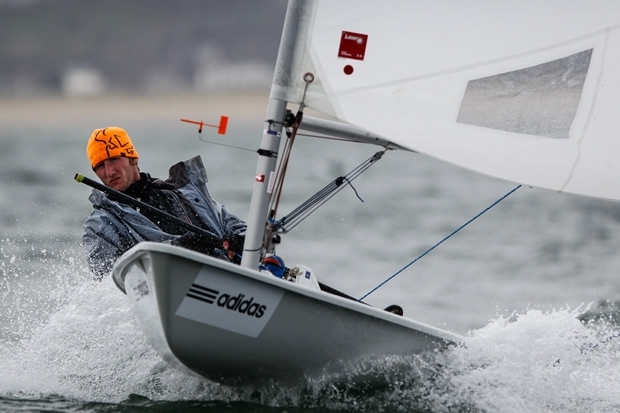 Edward Norbury and Charlie Hutchings (Warsash) lead the 29er silver fleet. Jenny Cropley (Royal Lymington) and Emma Baker (Weir Wood) four top five results today jumped them right up the score board to second, just one point behind Isabel Davies and Gemma Keers (Itchenor). “We had a really good day today, we won two out of our four races,” said Cropley. Alex Smallwood and James Scott (Datchet) are third, ten points behind Cropley and Baker and first boys. James King and Jack Butters (Parkstone) had another stunning day on the water, however their straight line record of firsts has been disrupted by Sophie and William Heritage (Gurnard SC). Caleb Cooper and Megan Smith (Grafham Water) are third. Racing is scheduled to start at 10.25 on Friday.